Hybrid shoes seem to be the latest thing, and hey, who doesn’t want to combine two of their favorite footwear styles into one seamless package? One particular hybrid that caught our eye is the new “Duckies” style from New York brand Amongst Friends. The style was released for the brand’s Spring 2011 collection and will be available in the next few months. The Duckies ($TBA) style combines the silhouette and basic style of a sneaker with aesthetic details reminiscent of a classic winter duck boot. 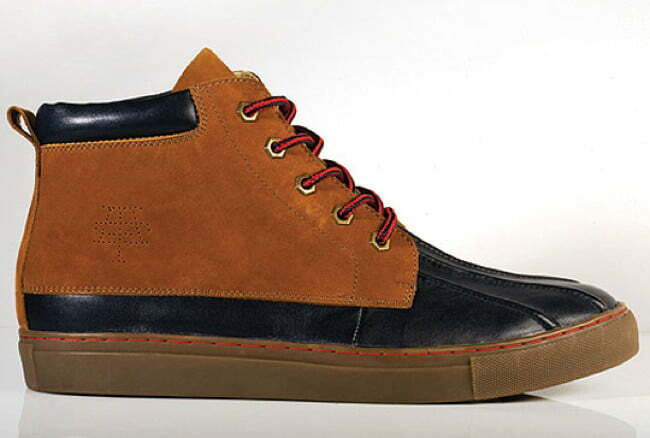 The boots feature round red and navy laces, a duck-boot style waterproof toe design, and what looks like a suede upper. An additional colorway (seen below) will also be available, and the fabric and color choices give it a more spring and summer feel than the darker style above. Not a bad option to rock on the weekends with jeans, and an especially good choice if the Spring weather in your area is more rain than sunshine (ahem, Portland).